I’m going through a survival phase, so I’m looking up all the edible foods in my area. In this experiment I identified the wild onion and garlic mustard, both of which are very abundant by the Des Plains River. I have found out that most wild picked food really is not good. At all. I found many online “experts” who claimed all these things were succulent and delicious and perfect substitutes for farm grown veggies. They are wrong. Garlic mustard for example was extremely bitter, even after boiling in several changes of water and cooked in a cream sauce. Still, I think if I use younger plants next time it will be a better result. 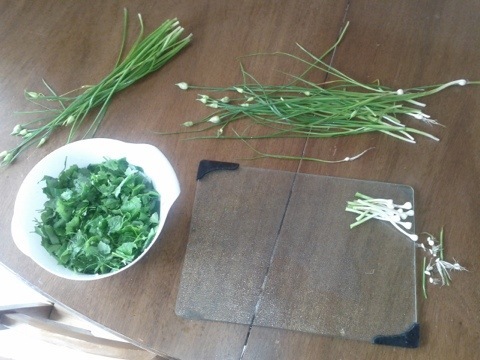 The wild onions, however were extremely tasty and a great substitute for green onions. Next time I hope I’ll have a perfected recipe for creamed garlic mustard.